Ever since I was a little girl I would watch them, perched in their daily spots, yacking and flapping their wings and their jaws, loud and boisterous at their chosen stoops—the old men and women I coined “the birds” because they reminded me of winged creatures congregating on the telephone wire. There were the wrinkly-eyed chaps at Dunkin Donuts who greeted my grandfather by name whenever we would stop in for cinnamon holes after a walk in the orange groves on a Saturday morning in Orange County. There was the black haired artist on the bench outside the Palm Springs library who would create intricate red and blue ballpoint drawings on lined notebook paper. There were the two Asian men who played chess at the picnic tables at the park between my high school and the public swim center, shouting at each other between crotchety-fingered moves. There were my mom’s senior citizen friends at the VFW on their barstools, cackling between sips of cheap vodka tonics. There were the Italian mobsters in Boston’s North End playing checkers and yelling at sports pub television screens over bouts of soccer next to the coffee shop where I bought my morning egg burritos from Seamus, an ex-seafaring captain. There were the 70-year-old, leathered skateboard riders at tables outside the coffee shop down the corner from my seaside bungalow in Venice Beach. There were the inky black hustlers in the park on Fillmore Street in San Francisco, shushing when the cops walked by before reigniting their various card games on concrete. There was the gaggle of Chinese fellas tussling over mahjong on the red lacquered tables outside my favorite downtown L.A. herbalist. They were an unconscious brethren that tweaked my soul and I desperately wanted to become one. I had to delve into the idea of what makes a bird in order to understand their lure. What was it about these communing flocks that tweaked my heart so? It was the idea of finding home, for only when one stakes down roots somewhere can one find a community to call one’s own. These were people who would ritualize their regular visits to coffee shops and pubs, bookstores and store lined benches because in these spots they cemented their own sense of belonging to a community. Whether singular or with others, these places and pockets of time were theirs and theirs alone. I realized that what I so desperately wanted to become was a person who had her own place. I maintained fantasies, whenever I would find myself in a spot ideal for birds, about my own future when I would join their universal club. At Greenblatt’s or Langer’s Jewish delis in Los Angeles, I would tell the Cute Gardener that I would love to grow old with him and a newspaper at one of their fine pastrami-slicked counters. I would secretly notice places that called to me, plotting the day when I could become a bird myself because I knew it meant more than patronizing for me, it meant committing to my own grounded state and claiming my own patch in the world after years spent roaming amidst the carefree unknown. Finally, two years after moving in with the CG and realizing that this was now my permanent home in the San Fernando Valley and the City of Los Angeles, I decided it was time to join the ranks of the birds. So far, I have embraced two locations that fit my personality just fine. Once or twice a week I drive down the hill from my home to a small shop called Coffee and Cream where the owner Hussein likes to hang his amateur paintings around the dimly lit interior space over the tubs of gelato and espresso machines. I sit outside on my laptop with a steaming chai to write and sometimes when it’s slow, he’ll show me the videos on his phone he’s made overlaying Alan Parsons Project songs over his videos of Sunset Beach at dusk. I am beginning to know the regulars—the guy in a leather jacket who comes in for morning biscotti or the little girl who comes in with her Mexican grandpa for his morning cup of Joe. My table is known as the place where a famous Saturday Night Live writer spent years cultivating his humorous skills over cappuccino. Once a month, I will hit the freeway and head into Chinatown where my favorite New Orleans deli, Little Jewel, offers authentic chicory tea au lait that boosts my word count for the day. 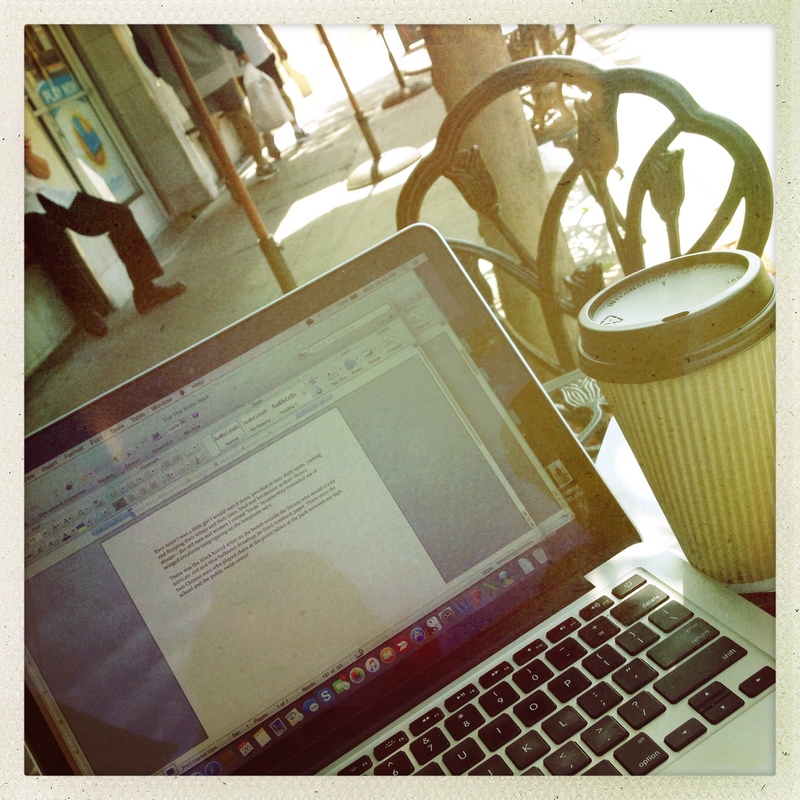 Outside on a cast iron table for one, I sip and watch the citizens go to and fro to work, pushing their baskets past the clumsy pigeons scouring the sidewalk for breadcrumbs. I listen to the jazz competing with the bus fumes and feel like I have finally come to know my permanent space in the world as both a writer and a human who, for so long, felt she had nowhere to go. 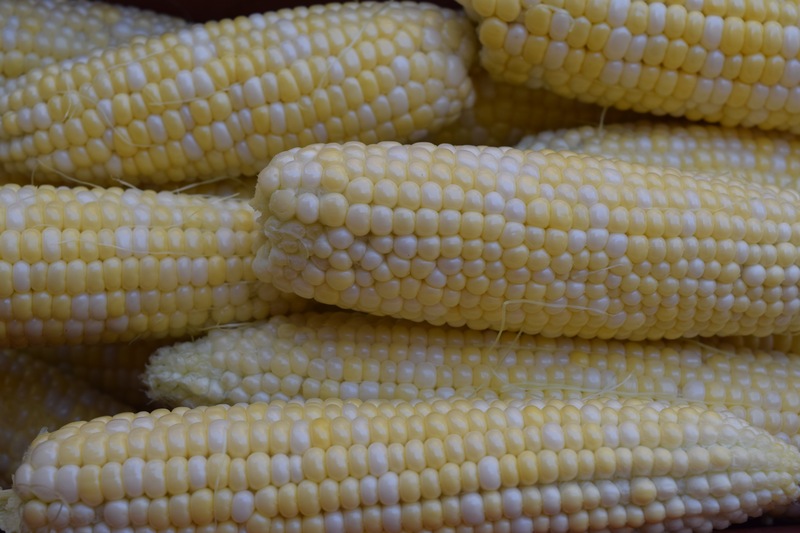 Tiny rows that look like pale yellow baby teeth greeted me as I carefully shucked the corn brought in from the back yard a little over a week ago. This year’s harvest was bountiful—having for the most part escaped the eager teeth of gopher and rat—nearly twenty stalks lay at my feet in the backyard. I yanked the bushy tuft of reddish hair atop each ear and quickly yanked the green husk down to reveal the gorgeous crispness inside. One after another into the waiting bucket before the Cute Gardener would tenderly slice the kernels from the cob in the kitchen—half remaining for a summer salad lunch and the other half to be frozen for later in the year when we might be tweaked by particular cravings of the long lost summer. 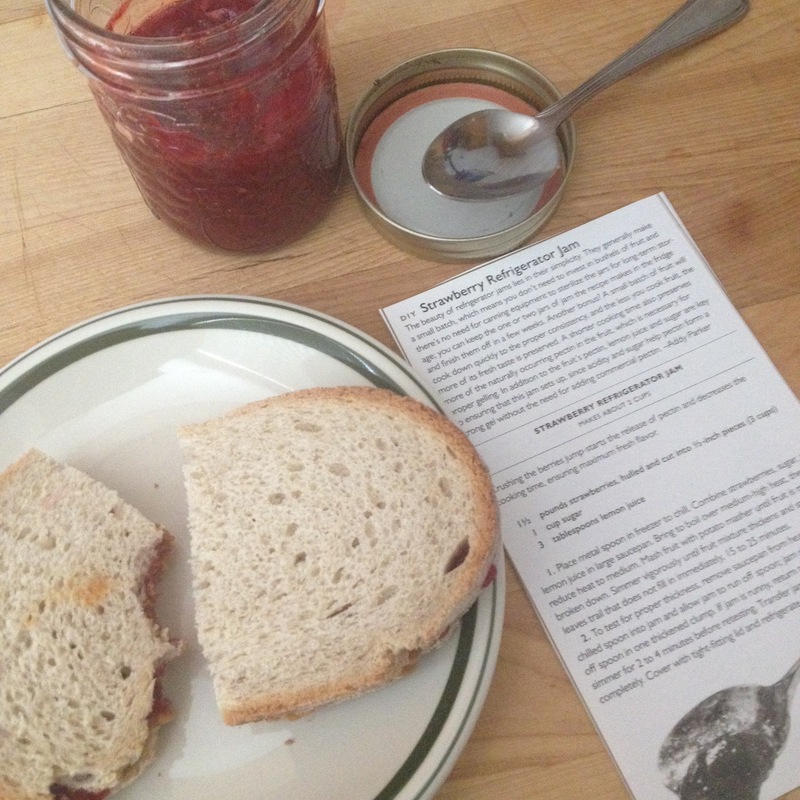 Before emptying the bucket, I snatched an ear and bit into its crisply sweet top, typewriter-chewing my way around its circumference in the way that a garden pest might. It was too irresistible not to try a piece of the vegetable raw, fresh from the garden and at its optimal best. 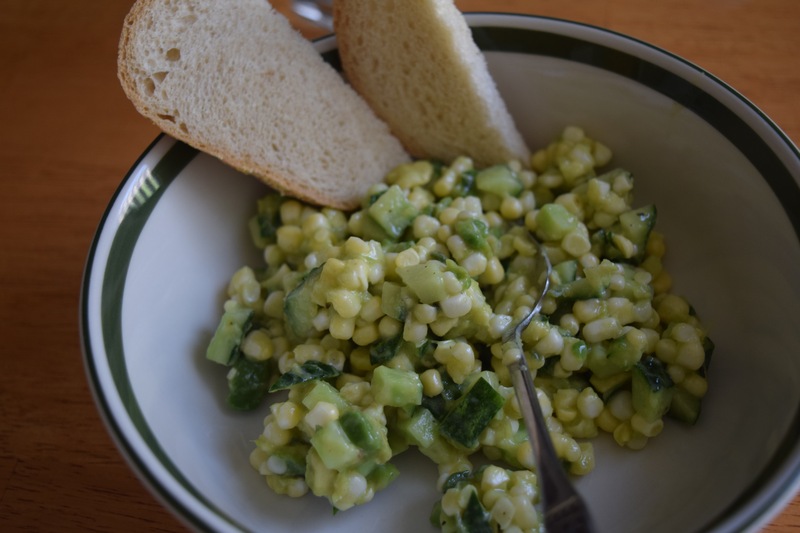 As we enjoyed our salads later, naked and spent cobs simmered on the stove in the first of what would be hours toward making a concentrated corn stock verging on syrup for experiments in the future. Would we try it out in a loose corn bread, whip it into a soufflé of some sort or use it as a base for chowder? We would decide later. For now, in our bowls a tumble of lukewarm kernels were playing nice with a casual toss of minisculely-diced avocado, cucumber, and basil chiffonade and the slightest drizzle of oil. Just enough to coat all the ingredients but not too much lest the corn not be the star of the show—a show that is so fleetingly seasonal that it offers one or two weeks of crop at the most, something to be savored and enjoyed in those lucky years when the moles in their bunkers and holes decide to share with us humans who have so painstakingly grown the wares. 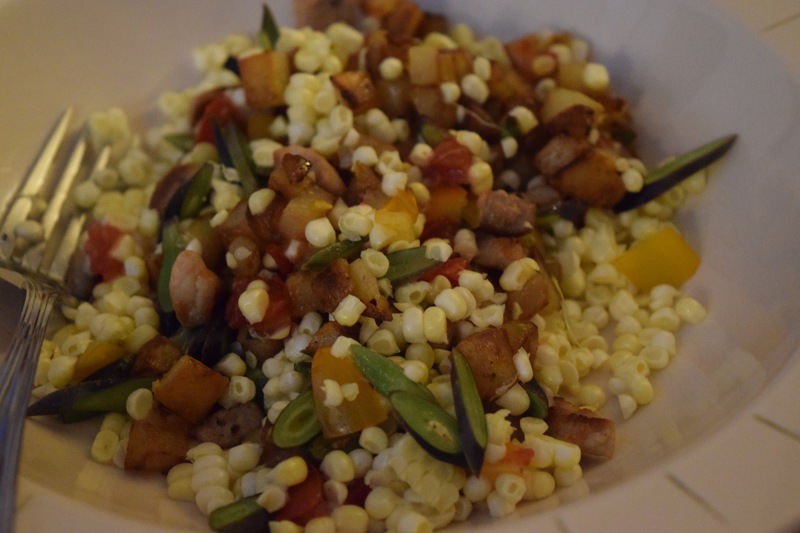 Experiments in modern day sautéed pork succotash ensued for dinner followed by another fresh luncheon salad tumbled with tomato but I fear our supply is now running low. I can only see only three spindly stalks from my office window bending in the heat like taffy, tired from bearing the brunt of such abundance. I believe it is true in the case of anyone who calls him or her self a foodie that they are more often than not a lover of all foods with little exception. Perhaps an allergy keeps them away from hot spices or an early, traumatic bite of mayonnaise from an overeager sandwich-making mother might form a lifelong aversion to the spread; but these are rarities. Part of being a foodie means having an adventurous and ever-curious palate. So we eat all kinds of things considered both high and lowbrow and tend to live by the “one bite rule” of boldly trying everything once before making absolute decisions. We are more prone to continually tasting new things than we are to consistently repeat old things. But there are those special “weakness” dishes that every foodie can account for that they will eat time and again, even hunt through endless cities for, and revisit the same locations on multiple occasions for—demonstrating the kind of behaviors borrowed from addicts and hedonists. 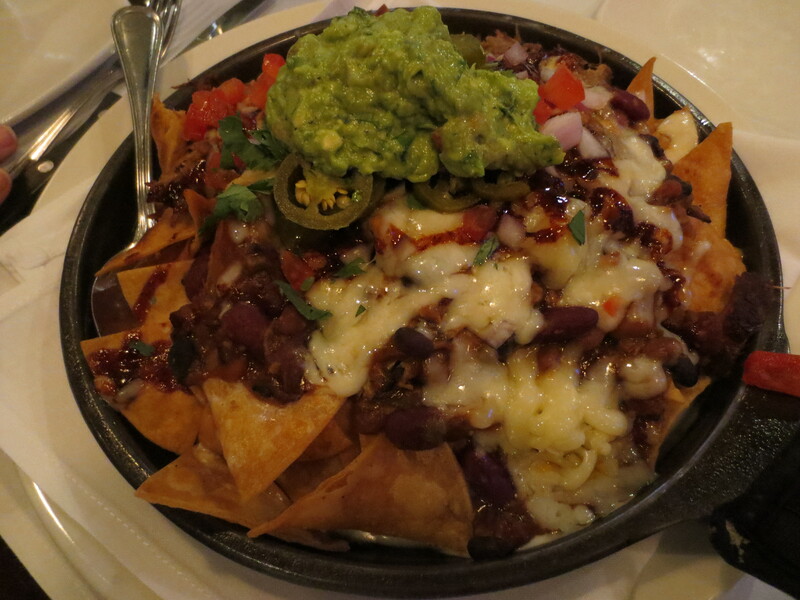 My Achilles Heel, without a doubt, remains a towering plate of nachos. I have come a long way since my high school days when I would come home off the big orange bus and head straight to the kitchen where I would pile a paper plate with Tostito rounds, a pile of grated cheddar, a dash of garlic salt and then nuke it to oblivion. This always produced a kind of nacho Frisbee that I had to pull apart—a chewy here and crispy there disk of salt and fat with no real culinary value. But the initial lust was the same as it is today—a want for a crispy chip, a hankering for gooey cheese, and a desire to dip that all into toppings that when blended create an effortlessly delicious and creamy swath of lust. This is my comfort food of all comfort foods. What makes a perfect plate of nachos for me? Thick house made tortilla chips with a wicked crunch are essential. I have bypassed ordering my favorite dish at many a restaurant upon hearing they use store bought chips. If they aren’t house made I will make an exception, but it better be a damn good chip befitting my description above. They can’t be flimsy or fragile in order to be able to heft up a good amount of dip and they better not get soggy before I reach the bottom of my pile. Then it is all about layering toppings in a balanced ratio so that it’s possible to get a bit of each in every bite and one ingredient better not run out faster than another. Whether it is a traditional plate of Mexican style nachos with beans, guacamole, sour cream, shredded beef or chicken and a savory chorizo cheese sauce or a gastro pub artisan plate with carne asada, queso cream and diced tomatoes, the ratio is elemental. Other than that, I am not a nacho purist. Today, I don’t eat nachos much. My hips would be gargantuan and my heartbeat an erratic misfire of cardiac pulsations. But I have become a nacho connoisseur, seeking out the best from a sea of the ordinary rest, and when I find them, it’s just like unwrapping that exact thing we want on Christmas morning. So instead of a top ten nacho list, I keep mine at a manageable top three. TLT Pork Belly Nachos in Westwood, Los Angeles, California – This perfect one basket meal for the UCLA college students consists of braised chunks of tender yet crusted pork belly, pico de gallo, and a signature pinkish cheese sauce over fresh chips. Gus’s BBQ Pulled Pork Nachos in South Pasadena, California – I will sidle up to this bar again and again for a lazy Sunday afternoon cocktail and a plate of these exquisite nachos to share with the Cute Gardener. The best homemade tortilla chips hands down come topped with pulled BBQ pork, four cheese sauce, BAKED BEANS (! ), smoked mozzarella, jack cheese, tomato, red onion, guacamole, pickled jalapeno and a drizzle of BBQ sauce. 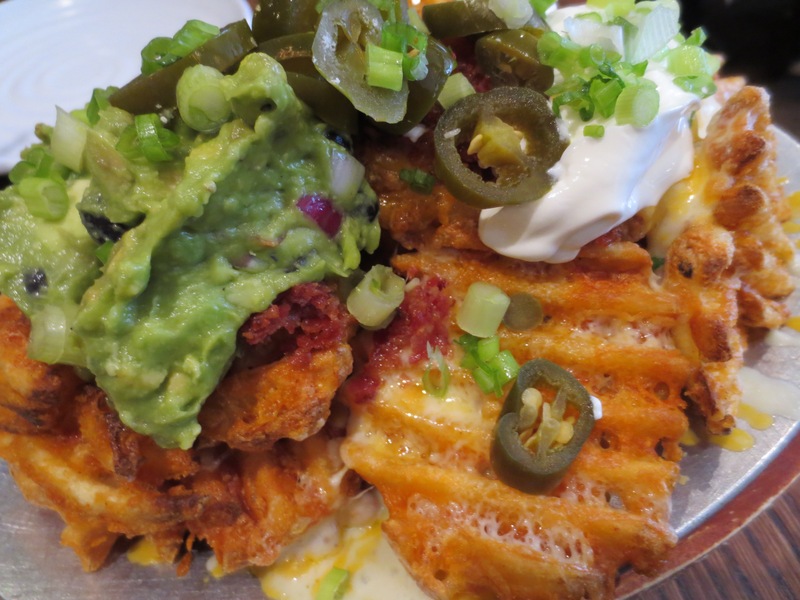 Nacho Waffle Fries at Napa Valley Burger Company in Sausalito, California – Perfect puffy waffle fries with airy centers and crispy nooks and crannies are piled high with shredded cheese, chopped bacon, guacamole, sour ream and house pickled, tangy jalapenos. It is like a potato skin that has gone to finishing school and returned home knowing how to salsa. I have visions for my nacho future, too. I am always dreaming up combinations. Lately, I have been visualizing and looking out for a good plate of Peking duck nachos. I have never seen nor heard of this but imagine it as something dark and smoky, sweet chunks of hoisin-coated duck with tiny slices of green onion, a cooling white cream sauce, and those crispy Chinese noodles fried to powdery smithereens on top. Maybe this college football season while the CG and I resume our seasonal Saturday spots on the couch I will do some nacho experimentation and create a top three for the home.